I think in blogland tagging must happen in cycles because this is my second time in a few months and I wonder if this is the same tag going around. I've always wondered about stuff like this. Like when I was little and vacationing with my family in Wildwood, NJ, my sister and I had come down with chicken pox. At the beginning stages we thought they were mosquito bites and just went on swimming in the hotel pool with all the other kids. All of these kids could have been exposed and went back to their respective towns and spread our little red bumps to their friends. The chain reaction could go forever and last for years...there could be a kid today with a derivative of my chicken pox! I'm so sorry kid! And I'm sorry to you bloggers for relating this grotesque story to the fun act of tagging! I could've used a wholesome metaphor like a "pay it forward" type thing or a "breeze blows a dandelion in Indiana, causing a child to sneeze, causing a man to say bless you, causing a girl to meet the man of her dreams, etc. etc..." But no, I settled on a rash. Anyway, what I'm saying is this: a few months back I was tagged with the 7 weird things about me tag and as I was required I then tagged a few other bloggers. What if this is the same tag...circulating for months? Well, I was tagged by Mary, Andrea, Heather , Wendy, and a few other dolls, to list 7 weird things about me. I have way more than 7 so I should be able to avoid repeats from last time. 1. I do not, will not, cannot, eat mushrooms...yuck! Especially the type that come in Chinese food that resemble slimy little Darth Vader helmets....ewwwww. 2. I do not, will not, cannot, drive...no! I need control and don't trust the roadways. Of course I'm a passenger all the time, but that's about all I can handle. I've got my mind on all the other minds out on the road. I know how careless people can be and downright crazy behind the wheel and if my mind is on that then I can't wholeheartedly focus on my own driving...no driving for me. Thank goodness Aaron loves to drive...it's his hobby. 3. I draw on my eyebrows. Yup, I remove the pair I was given and draw on a pair that better suits my aesthetic. Sometimes this is a bit problematic...for instance, some days, depending on my drawing hand I can accidentally render my expression "angry" or "surprised" or "concerned"...and no matter how many times its happened in the past 14 years Aaron still gets me when he says "why are you so surprised today?". It takes me a minute and then I realize that I drew the brows on with a higher arch, which in the world of real brows signifies surprise. ps. the drawn on brows are faint and sometimes don't show up in black and white photos, so if anybody out there has studied that pic of me up top and on the Silver Bella site and thought I was eyebrow free...trust me they're there...in pencil form anyway. 4. I have been begging Aaron for a budgie for almost a year. I talk about budgies all day long, talk to my imaginary budgie, and even have conversations with Carlos (the chihuahua) about the budgie. Which reminds me...for an entire year before Aaron said yes to Carlos I carried a chihuahua bobble head in my purse everywhere I went. 6. A lot of times when I make Aaron a sandwich I will sneak in a surprise. It started years ago and to this day, when he bites in and makes the discovery he's still shocked and from the other room I'll hear him say " oh great...a grape...in the middle of my tuna sandwich." I love surprise grapes. They're harmless and keep you on your toes...it's just a taste, texture, and shape you weren't expecting between your leaves of lettuce. "What's the big deal?" Is what I always say back. 7. I cannot watch, or hear any tv or radio shows about medical mysteries. In the back of my mind I'll start cataloging the symptoms and after a while they'll build up and I'll diagnose myself with some freakish disease that in reality only happens to male Eskimos over the age of fifty. And Aaron knows this well. He always has on talk radio and if the guest is a disease expert he'll turn off the radio and put on a cd just so I don't hear. Now for these new designs from our forthcoming new collection. We're incorporating a much more layered look. A lot of blending of ephemera with hand painting and vibrant color...all of it sepia washed and aged. These were the first two on the drawing board. 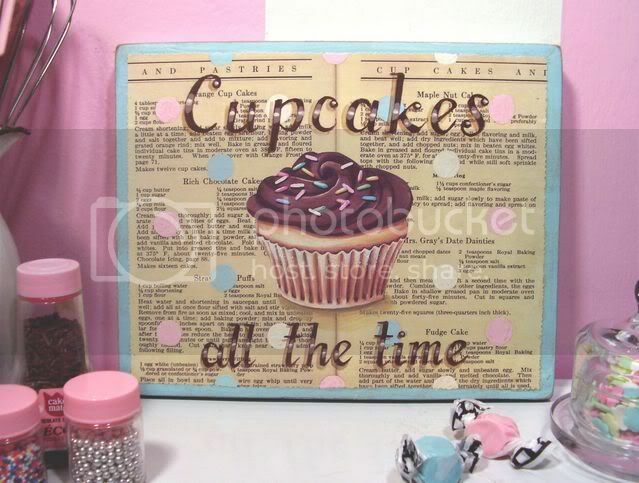 The "Cupcakes all the time" piece is 8" x 10" and is about 50-50 collage and hand painting. It's directly inspired by the color palette of my current Flickr favorites mosaic. 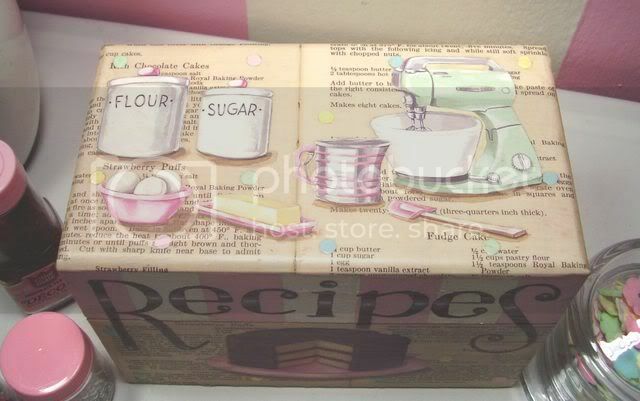 We are so thrilled about the recipe card box. We wanted a lot of detail and color and I think it fits the bill. Again, it's about half collage, half hand painting. 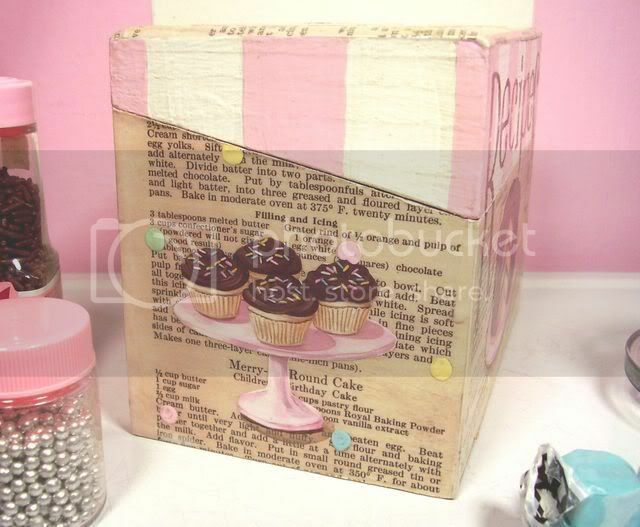 We've got lots more stuff like this coming...specifically, new versions of our classic cupcake trio. Both pieces above are now listed in our eBay store! I got my circle book in the mail today! Heather is hosting a polka dot fat book project wherein everyone involved will contribute their hand done pages that will be incorporated into amulti artist book that we'll each get back with our page along with all the other participant's pages. The circular book we're all using is by 7 gypsies and from Shosh at HannahGrey...what a fabulous site!! Go there Now if you haven't already...you'll love it! I can't wait to start my pages! I love that it's a circle. Fatbooks are often 4 x 4 squares. Also, polka dots are an essential part of my daily existence! When we're all done with our pages, Heather will combine, bind and send them back...and most likely the books will be FAT! I'm also working out some new ideas for a swap. I had so much fun hosting the Vintage Kitchen Swap and from the photos and emails I can tell that a lot of you gals did as well!! I'll have more info on that soon. In the meantime, browse the blogs and see who else is a weirdo...and I mean that in the nicest sense. spectacular weirdness! loved reading your post today. 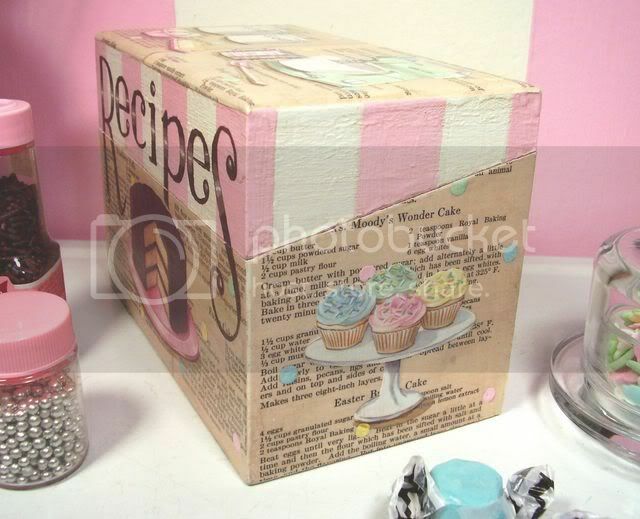 the recipe box is fabulous, i really like the hand painted and collaged details you are adding. at an estate sale last week i got a box of vintage grannie stuff and i can't help but think one of the little somethings is supposed to be for you. . . .
email me the particulars and i will mail away. J. Hey Jenny! Ok, I've been going through withdrawl not having a computer for 11 days. I checked my blog, then immediately went to yours b/c you were my biggest withdrawl. THank you soooo much for your sweet comments. I don't have time to catch up on all that you've posted on yours, but I plan to do it in between packing and cleaning and working the next couple days. Missed you. Have a great day! I was laughing thru this list. Yeah, mushrooms are gross. especially the Darth Vader helmets. I agree. I thought I was weird lol. Love your list of weird things. I wish I was that interesting. Your recipe box is awesome. Jenny, You are hysterical! I was laughing out loud reading those weird things! Ha! I love the sneaking of something extra in Aaron's sandwiches! You're too cool! Hi Jenny! Those were fun to read! I hate mushrooms too- eewww! The eyebrow one is so funny! I would never trust myself to draw on my own eyebrows for just such reasons! Mine would probably look crooked and surprised! Oh, and what on earth is a budgie?? I'm intrigued! The best of all is the surprise in the sandwich one!!! Sounds like a lot of fun, but my husband would freak out- you just do NOT mess with his food! Hmmm- maybe I could do it to my kids! LOL! I totally used to have that problem with diagnosing myself with every illness- so I too just avoid hearing that stuff! Your wardrobe sounds cute- all the colors and fabrics I love- but you should try the aqua- it looks fabulous on blondes! :D I image you would look pretty good in any color thought- you are just so stinkin' cute!! I was tagged, too, as is everyone I know in blogland. Stop by sometime, Miss Jenny! 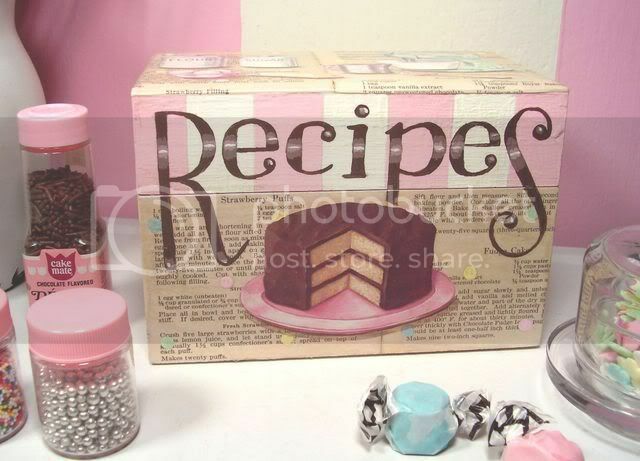 This recipe box: LOVE IT! I'm with you on the medical stuff! I always self diagnose - the Internet can be a very bad thing! Oh how fun!! I love people's individual little quirks. Sooooo cool to learn more about you! And FABULOUS new creations you've got there. Just darling! I just saw the fun interview you did on Create a Connection, loved it. Your list is too funnny, saw myself in some of those. Your new work is fantastic, love the colors!! I just found your site. It's lovey!! Oh yes, eyebrows! Mine are totally blond, and therefore invisible, so about every six weeks I have them dyed. Every time I walk in with my new darks eyebrows, my boys (12 & 15) scream "where have you put my mom you crazy looking lady?". They think I look startled!